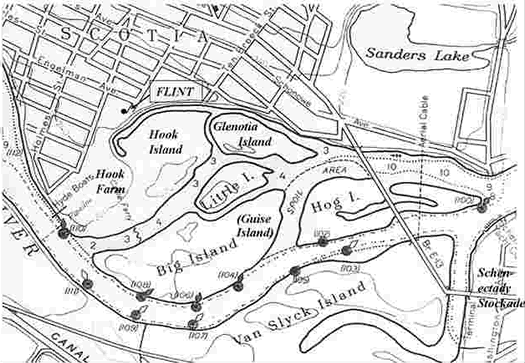 Growing up there in the '70s and having the full run of that island, we never ever heard it called "Glenotia." It was always Little Island or Isle of the Mohawks. (All of the islands there had Iroquois tribe names.) Having explored every inch of it, I honestly thought my great grandmother was insane when she told me there used to be an amusement park there, but there was, and it was in fact Glenotia Park, which offered baseball games, dancing, swimming lessons and general entertainment. A scant 45 years later, there was simply no sign there was ever a form of habitation on that island, and it was the private preserve of a gang of boys who grew up on the riverside. Looks like I've found my new if-I-won-the-lottery idea -- buy that island and build a house on it. Looks like a nice spot to live in (and it's in the Scotia school district, which would be alright). No permanent structures is the real killer for a private owner. It's not just in a flood plain, it floods all the time. It used to be, probably still is, that when the floods receded there would be stranded pools of fish left behind. Not a pretty sight, or smell. Ever here the ditty about buying swampland? @Lola: Agree. I wonder if it might be a candidate for a conservancy of some kind.